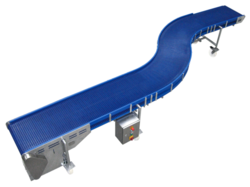 Modular plastic conveyor belt available with plastic chains in Polypropylene, Polyethylene, and Polyacetal. To convey the products for Food, Pharmaceuticals, beverages, fruit etc. Industries. Parts of the belt can be easily replaced. These are made up of plastic hinge rods, modules, and sprockets which will assurance for safe and hygienic product conveyance. Due to its plastic body, it will operate without noise, friction less and with less maintenance and easy sanitation. which will avoid trapping of food particles in the belt. Our organization is standout in offering Modular Belt Conveyor to our clients. This product is perfectly made by our experts who in the process have used various types of material comprising aluminum, iron and other metals. This product is offered in various dimensions to our clients and has high tensile strength. It is made completely portable and has played an important role in easy conveyance of food and industrial products. 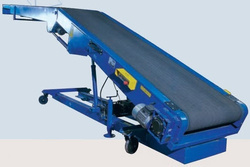 We are one of the leading manufactures of Truck Loading Belt Conveyor.